Venezuelan President Nicolas Maduro has agreed to talks with the opposition – with the Vatican as mediator, Reuters reports. CNN's Christiane Amanpour asked President Maduro about this very idea - of having the pope as mediator - when she interviewed him exclusively last month in Caracas. And you can see the rest of Amanpour's interview with President Maduro here. The stand-off between Venezuelan President Nicolas Maduro and the opposition is heading for a perfect storm, with worrying signs that the worst protests in a decade could eventually lead to total economic collapse. In an interview with Amanpour in Caracas earlier this month, President Maduro said that Venezuela did not need outside mediation. But the two sides aren't talking to each other, and now more than three dozen people are dead – most recently a 28-year-old woman shot in the head after her bus was stopped at an opposition barricade. The OAS itself has come under criticism for its inability to intercede in the crisis. Click here to view the photo gallery in large format. In this web extra, Christiane Amanpour asks Venezuelan President Nicolas Maduro about access to Twitter and social media in Venezuela. More from Amanpour's interview with President Maduro. 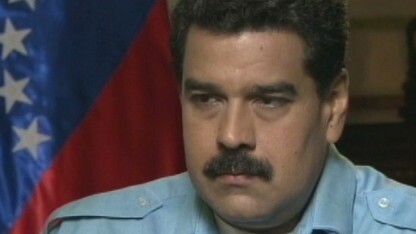 Part two of Amanpour's exclusive interview with Venezuelan President Maduro. Translation was provided by the President. 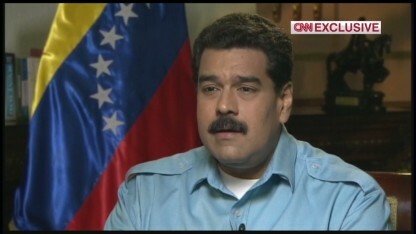 In this exclusive interview, CNN's Christiane Amanpour speaks with Venezuelan President Nicolas Maduro. Click above to watch. Full coverage of Amanpour's interview with President Maduro. English translation was provided by the President’s office. The transcript of Amanpour's full interview with President Maduro is available here. What follows is a transcript of Christiane Amanpour's full interview with Venezuelan President Nicolas Maduro. Video of the full interview will be posted here soon. CHRISTIANE AMANPOUR: Mr President, thank you for joining me, welcome to our program. PRESIDENT NICOLAS MADURO: Thank you for being here with us here in Venezuela. Venezuela is in the throes of the biggest protests since the death of President Hugo Chavez a year ago. People are outraged in the oil-rich country at record inflation, shortages of basic goods, and high crime rates. Thirteen people have been killed since the demonstrations began. CNN’S Christiane Amanpour spoke on Wednesday with Maria Corina Machado, an opposition member of parliament. Click above to see Amanpour’s full conversation with Machado. Venezuela’s political deadlock presents a “delicate and complex moment” for the country, Venezuelan historian and political scientist Margarita Lopez Maya told CNN’s Hala Gorani, sitting in for Christiane Amanpour, on Monday. The country’s simmering protests could come to a full boil at any moment, with a dramatic showdown shaping up between embattled President Nicolas Maduro, the former bus driver and handpicked heir of Hugo Chavez, and opposition leader Leopoldo Lopez. Three people were killed in violent clashes in Caracas last week; Maduro's government blames Lopez, ordering his arrest on charges of murder and terrorism. Lopez asserts his innocence and dropped out of sight, until last night, when he Tweeted a video call to action, saying he will lead peaceful march on the ministry of justice on Tuesday. CNN reached out to offer the Venezuelan government a place on the program; they chose not to appear. Editor's note: You can watch an extended version of the audio message sent to CNN by Lopez here. CNN's Amanpour approached Venezuelan opposition leader Leopoldo Lopez for an interview. He was not able to break cover to speak with Hala Gorani, sitting in for Christiane Amanpour, but he did send an exclusive audio response to our questions. Click above to listen to Lopez's message.